Police officers were pulled from New York City public schools after the massacre in Florida, prompting outrage from some parents and teachers. The NYPD officer assignments were eliminated by Mayor Bill de Blasio because he said the new community policing units will go into schools instead, while patrolling neighborhoods. The decision predated the Feb. 14 massacre in Parkland that left 17 people dead but that shooting has left parents and teachers advocating for the positions in the city to be restored. 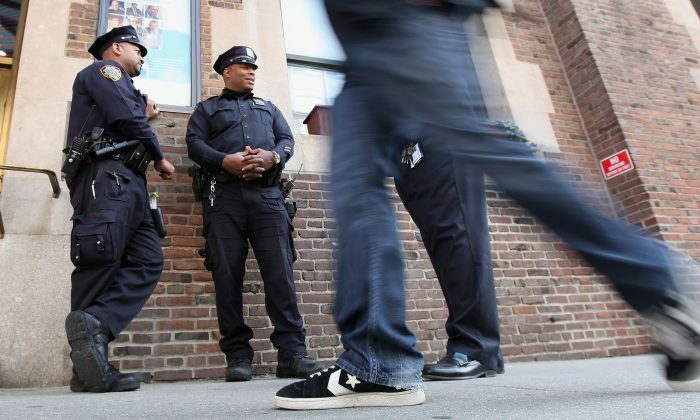 The Parents-Teacher Association is calling for the NYPD to restore the full-time police officer positions in schools, and leaders have collected more than 1,000 signatures. Councilmen Steven Matteo and Joe Borelli have asked de Blasio to place armed officers in all of the city’s 1,700 schools, but the mayor previously said that it would cost too much. All schools have at least one school safety agent, but safety agents do not carry guns. “The school safety agents are great and they do a phenomenal job and they do a very important job of monitoring the front door but unfortunately we have seen school shootings like this one in Parkland and of course Sandy Hook before this,” Borelli told Pix11. The New York State Sheriff’s Association called after the Parkland attack for funding at the state level to place armed school resource officers at every grade school and high school in the state, reported The Epoch Times. But de Blasio told state lawmakers in February that it would cost $1.2 billion a year to place just one armed officer in each school, reported the New York Post. There was an armed resource officer at Marjory Stoneman Douglas High School in Parkland, but he did not enter the building when the shooting occurred. The officer, Scot Peterson, was later suspended, then abruptly resigned. Budget cuts in Florida caused many districts across the state to cut the number of school resource officers in each school, reported TC Palm. For instance, in Escambia County, all high schools had two officers but after the cuts they only had one.